The Clippers cruised to a 6-2 win in their season opener against Maranacook. 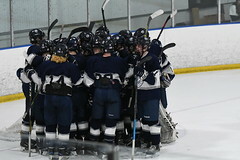 Yarmouth will face a tough test this Wednesday when they head to Watson Arena at Bowdoin to take on Brunswick. Game time is 6:30 pm. Yarmouth dominated the opening period as they outshot Maranacook 14-1. Just over three minutes into the game, Spencer King ’20 opened up the scoring with an unassisted tally off a rush. 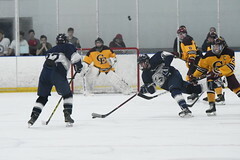 Sam Marjerison ’19 then extended the lead to two goals with his deflection into the top corner of a low shot by King. With six seconds remaining in the opening period, Jacob Veilleux ’20 picked up his first Varsity goal with nice wrist shot from the point. Cam Miller ’22 and Alec Morton ’19 picked up the assists. Maranacook came back in the second period with breakaway goal, but Kurt Heywood ’19 responded with a power-play tally assisted by Michael Guertler ’19 and Marjerison. 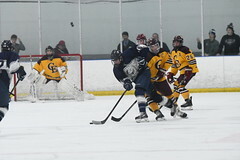 Later in the period, Will Giese ’20 (Jacob Veilleux, Marjersion) buried a shot after a nice outside-in move and the Clippers took a 5-1 lead into the locker room. Yarmouth was a bit sloppy in the third period and Maranacook was resilient. The Hawks picked up a goal to make the game 5-2, but Joe Wilson ’19 put the contest away with a nice shot just inside the post for his first Varsity tally. Michael Guertler was credited with the assist. Charles Henry Watson picked up his first Varsity win in net. The night was a sweep for Yarmouth as the Girls’ Varsity blanked Brunswick 2-0 prior the boys game. The Girls’ improved their record to 2-1.